The requirements of a fleet management system are often very specific: Every business offers a different working environment for the forklift trucks in a fleet. 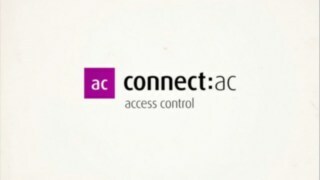 Accordingly, you can combine the individual function modules of connect: to form one system that optimally meets your individual requirements. The application enables the unlocking of forklift trucks using PIN or RFID, the assignment of operators and forklift trucks, as well as the administration of rights (such as operator's license and eye test). connect: documents the use of the fleet forklift trucks: Was a forklift truck being used a lot, or was it often not in use? Were there any accidents? Is the forklift truck functional? Was there an accident? Is part of the company site uneven? Is a operator driving without care? connect: crash detection records the time and severity of heavy shocks which could lead to forklift truck damage. Is a forklift truck rarely used? Will it soon exceed the operating hours agreed upon with the leasing partners? With connect: operating hours, fleet managers can regularly determine the deployment duration of your forklift trucks. Does an wearing part need to be replaced? 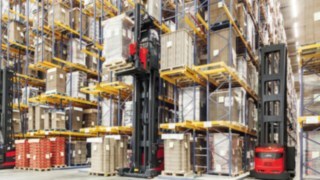 Should a forklift truck be taken out of operation as a precaution? connect: trouble codes provides qualified information on errors on the forklift truck, even those which will not immediately limit performance. 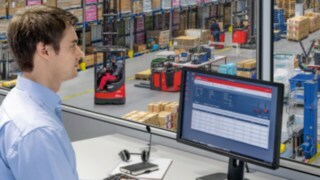 With connect:an fleet managers analyse and monitor the performance of their fleet: How often does a forklift truck drive or lift? How much energy is it using? connect: knows the current location of each forklift truck. Is it in a warehouse or moving around outside? Is it approaching a particular warehouse area? Fleet managers can thus control forklift truck functions independent of location. 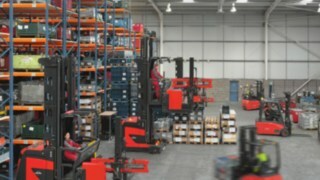 Are many forklift trucks and people moving around in the production or warehouse areas? Where are the forklift trucks? 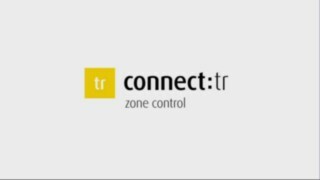 connect:tr controls internal traffic safely and easily without additional infrastructure. People and forklift trucks cannot be located within a building by GPS signal, because the walls block the satellite signal. The Intralogistic Navigation (IntraNav) technology from Linde partner Quantitec shows that positioning down to the centimeter is nonetheless possible. It allows inertial sensors and radio-based runtime measurement to be effectively connected. The result is the most precise, most suitable positioning system for industrial applications in interior and exterior spaces.